The inductive linear position sensors operate contactless and wear-free according to a revolutionary measuring principle. The position is not detected via a positioning magnet but via an oscillating RLC circuit. 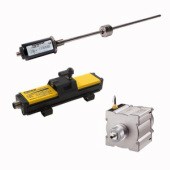 The product portfolio comprises magnetostrictive linear position sensors for position tracking in hydraulic cylinders or encoders for the tracking of floats as well as draw-wire sensors.